Peeking shyly from sandy soil, these soldiers of Spring are a true April-May delicacy. Whether pale, undercover and interesting, exotic purple or (appropriately) spring-green, asparagus attracts us like no other vegetable. A few of you may demure from its herbal charms, but for the rest of us the arrival of this short-lived crop is nothing short of sigh-inducing. It is one of the few vegetables that really is at its best nearly naked, save for a butter sauce, or something like this carrot-miso concoction. To be honest, I like it best plainly roasted, then finished off with lemon and salt as it comes out of the oven. If I can be bothered it instead gets tossed onto a griddle pan to get those pretty, restauranty charred bits, but the oven is fine. I could eat it this way for days on end, only turning to ‘fancier stuff’ like this sauce when the sudden novelty wears off, or when just a heap of oddly-addictive vegetation – no matter how wonderful – won’t suffice. If you went to a farmer’s market at the weekend you will no doubt have seen folk carrying paper-wrapped bundles of this delicate-budded plant. Looking pretty pleased with themselves, I might add. Sure you can get good stuff from the supermarket, but what a special treat to pay over the odds for a stiff-as-pencils parcel of super-fresh asparagus. The best of the best comes from the Vale of Evesham, in the West Midlands, an area known for its particularly fertile soil. Asparagus is so special here that it gets its own quite quirky festival to celebrate: I can’t think of any other vegetable that gets a lift to London’s Fortnum and Mason in a classic Morgan. Or has a tour bus named after it: the Asparabus.Would we do that for carrots? I think not. Other countries celebrate their asparagus crops, so it’s not just the British who are mad for asparagus. But really, our crops are the best! Do you love asparagus? What’s your favourite way to eat it? Have you ever been to an asparagus festival? Part dressing, part sauce, part dip! This is pretty similar to the dressing that douses the too-cold lettuce and mooli salads that you get at US Japanese steak houses. Although I haven’t had such a salad in a looong time, I remember the rather lurid-orange dressing tasting like this. My memory may be faulty in many regards (Queen Key-Loser here), but with regards to food memories, it is near-faultless. Keep it thick for a dip or loosen with more vinegar, lime or some water for a pouring sauce or dressing. Store in a lidded jar for up to a week in the fridge. 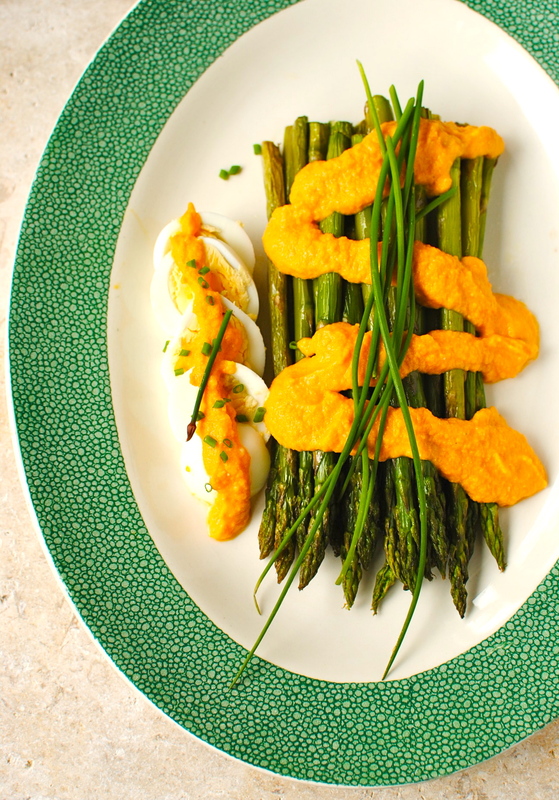 I’ve roasted some asparagus and hard-cooked some eggs to make this a light lunch for two people, but you can have this sauce with pretty much any salad or pile of vegetables, or use as a dip for raw vegetables and flatbread/breadsticks. It would also liven up a brownbag grain, lentil (or any protein) and veg salad. Pop everything but the pepper and honey into a blender or food processor. Use the pulse button if you have one to get everything roughly chopped. 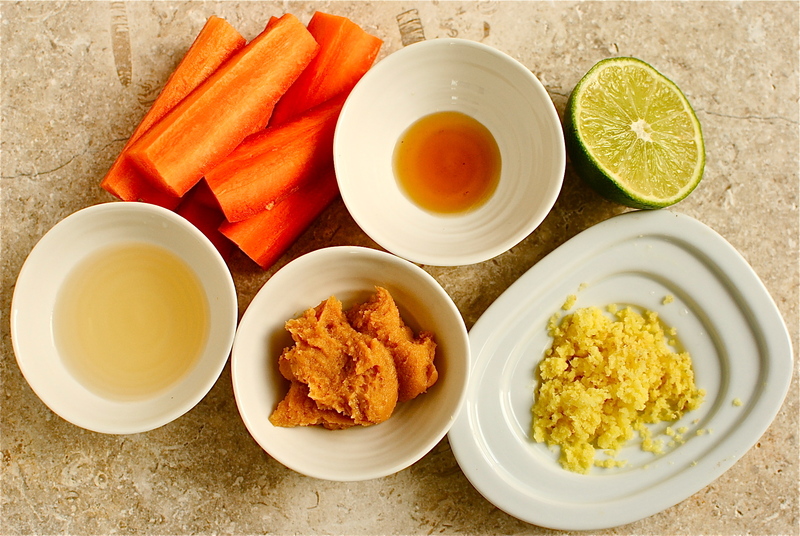 If you don’t have a pulse button I would have the carrots and ginger grated prior to blending. Once everything is roughly mixed and chopped let the machine run until you get as smooth a sauce as possible. It will be quite thick (as seen in the images). Taste and see if you want to add white pepper and/or honey. If you want it thinner, as for a salad dressing, just blend in a little water, lime juice or vinegar, depending on your taste preference. First of all cook the eggs to your liking. I like hard-boiled with this (and anyone on chemotherapy should have them hard-boiled), but soft boiled would be lovely and ‘melt’ into the sauce on the plate. If you aren’t sure of the best way to cook eggs, ‘Saint Delia’ is your woman. This British cooking icon is the first lady of cooking instructions, and is rather famous for her explicit instructions on how to boil eggs. No, really. She may irritate with her schoolmarmishness, and she may not be the most exciting of cooks, but no one can fault her recipes. I love her ginger cake recipe. So, eggs on the go, let’s get on with the asparagus. Which is dead-easy. Preheat the oven to 200C/400F. Wash and pat dry the asparagus, removing any grit. Take each spear and gently bend the lower third until the woodier end bit snaps; discard the snapped end. Get a large baking tray and lay on the trimmed asparagus. Drizzle with 1 tbsp of olive oil and gently roll the spears around (the tips are a bit delicate) until each spear is glossy. Place the tray in the hot oven and roast the asparagus for about 10 minutes, checking at eight minutes to make sure they aren’t cooking too quickly. Remove the tray from the oven and divide the asparagus between two plates. Peel and slice the hard-boiled eggs, and divide between the plates. 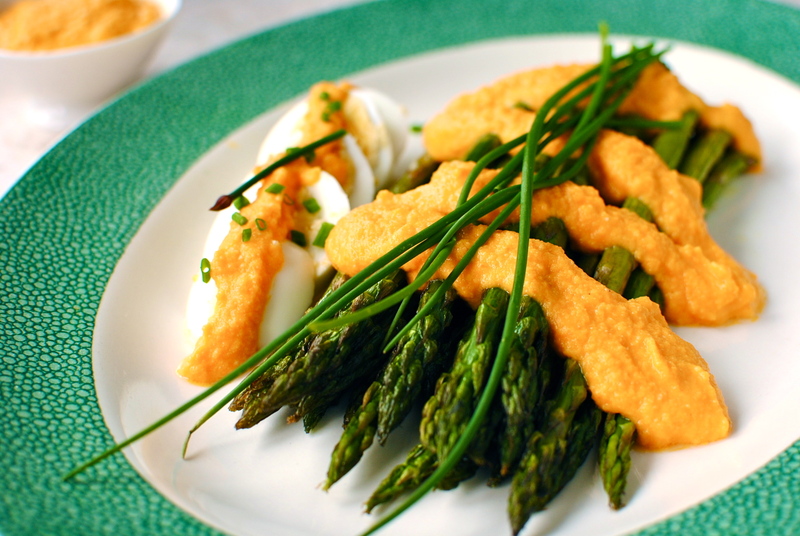 Drizzle over about a quarter of the sauce on each dish of asparagus and eggs. Garnish with chives if you like. Eat immediately. Keep the remaining sauce for up to a week in a tightly-closed jar in the refrigerator. Use as a dip for raw vegetables instead of hummus, as a sandwich spread with avocado slices and fresh sprouts, as a healthy dip with breadsticks or similar. 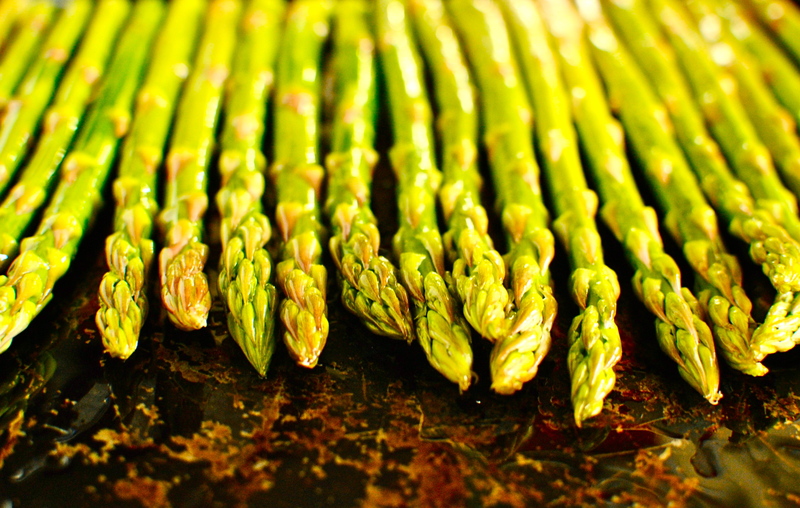 I am sharing this over at Laura (How To Cook Good Food) and Nazima’s (Franglais Kitchen) One Ingredient Challenge, where this month’s featured food is Asparagus. I will also pop this over to Mark at Javelin Warrior’s Cookin w/ Luv Made With Love Mondays roundup, and over to the lovely Ren Behan for her monthly Simple and In Season feature. It is so good to visit these fab sites and get new, fresh ideas. Aaaah, we too are huge asparagus fans and only last night we all said we could eat it every single day of its little season and be happy as Larry. We are super lazy with it as I just steam them and normally have a little oil on them. Last night we tossed them into a giant black rice (or grass seed I really ought to say on a proper foodie blog) salad which had fennel, cucumber, chilli, spring onions, mango, coriander, lime, a soy and ginger dressing, oh and some flakes of kiln cooked salmon, yum. We haven’t been to a Festival but we have been to the fields just north of Shipston-on-Stour during May and popped our money into an honesty box at the edge of a field and went off with lots of little bundles of asparagus and they were the best we had ever tasted. Ah, the good old British honesty box 😀 We have done that with daffodils, potatoes and jam (England), and handmade candles (Wales), but never asparagus. Maybe I should time a holiday to do just that. 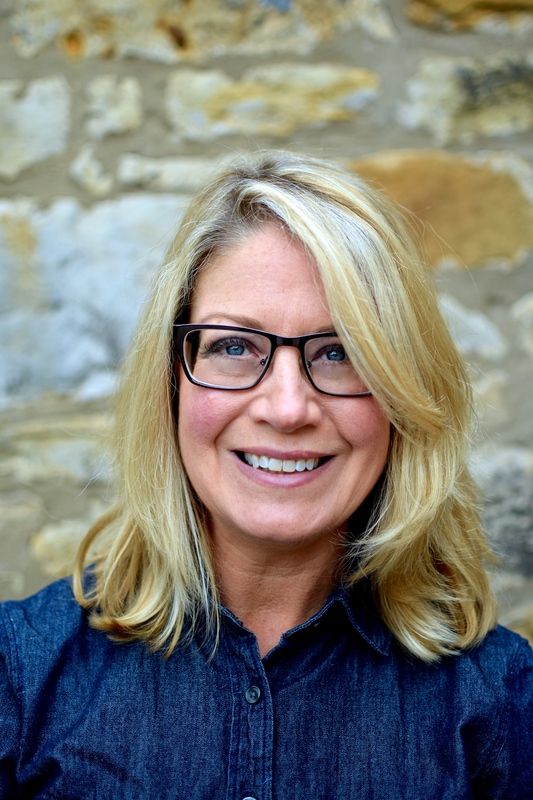 You know how I love planning holidays around food! But your recent salad – MMMM. I am nicking that idea and doing that soon for the family. You always make such inventive salads. By coincidence I bought asparagus today at my favourite shop so here goes as I always have carrots! I’m not sure if that is up Mr B’s street but let me know if you make it! Thanks Suzan! I was worried that I had gone on metaphor overload. Absolutely not. Very enjoyable read! And as always, beautiful mouth-watering pictures! It is always great to have something that fits in with your and Nazima’s fabulous One Ingredient challenge. Asparagus was an easy one for me as it is such a fave. What a lovely celebration of asparagus! I agree that a light touch is all that is needed for the grassy flavor to shine- just as the first bright rays of spring sunshine! Finally the first bright rays are here – hooray! Really love your latest post about wheat berry bread – irresistible! 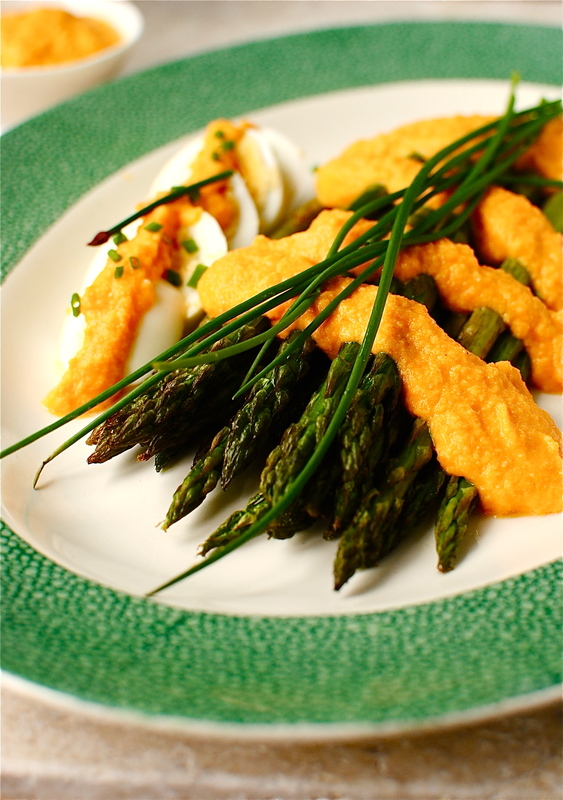 We have been devouring asparagus over here – so delicious! My absolute favorite way to prepare them is to peel the stalks, lightly brush with olive oil, salt and pepper and grill. so good! Mmm, you really can’t go wrong with that approach. Our asparagus is probably thinner (not quite sprue though) so doesn’t need peeling. But the fat stuff can be so flavoursome. I think I might have to try Liz of Bizzylizzysgoodthings.com’s recipe next. hi Kellie what a lovely dressing i do love the flavour combination and the colour in this dish. So often I use the Flemish way with chopped hardboiled egg as a garnish but this is a great idea and I love miso. Yum!